These double berry cupcakes include a blend of raspberry and strawberry puree in both the cupcakes and the frosting. 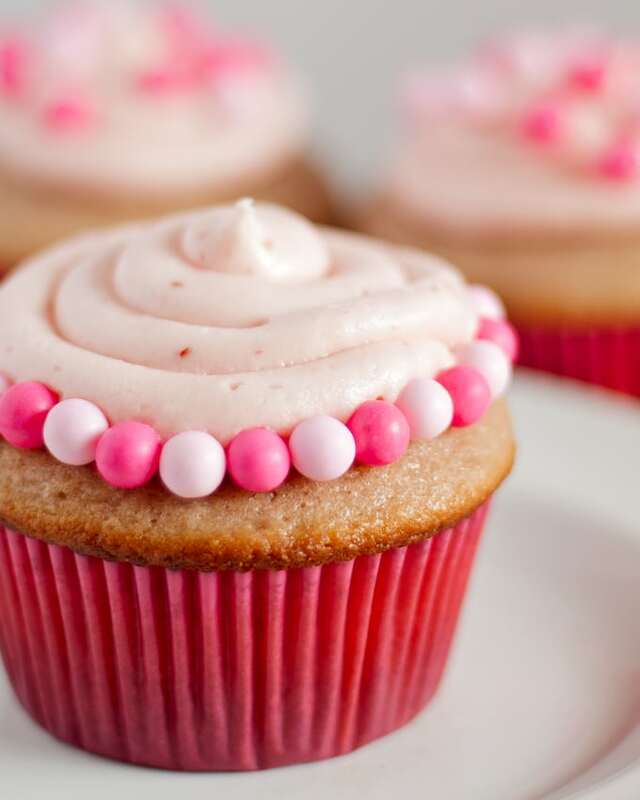 They are easy to make and perfect if you are participating in the Cook for the Cure #10000 cupcakes campaign. Today we are supporting the Cook for the Cure campaign! Cook for the Cure gives people who love cooking (us!) a way to support a meaningful cause. It raises funds and awareness for the fight against breast cancer and there are so many ways for you to get involved. You can host your own Cook for the Cure fundraiser using a Cook for the Cure Party Kits (funded by KitchenAid). Invite your family, friends or colleagues over for a dinner party, barbecue, office party – really, any kind of get together. Instead of wine or flowers, ask your guests to bring a donation to Komen. KitchenAid also hosts cooking classes, auctions and special events where 100 percent of the money raised goes straight to the Susan G. Komen Foundation. Awesome, right? If you’re looking for appliances, check out hhgregg. You can purchase Cook for the Cure KitchenAid products at hhgregg! It’s as easy as that and there are some really cool pink ones available, like this stand mixer. You can also join me, and participate in the #10000 cupcakes campaign! We wanted to jump in and get involved right away so we are joining the 10,000 cupcakes campaign today. 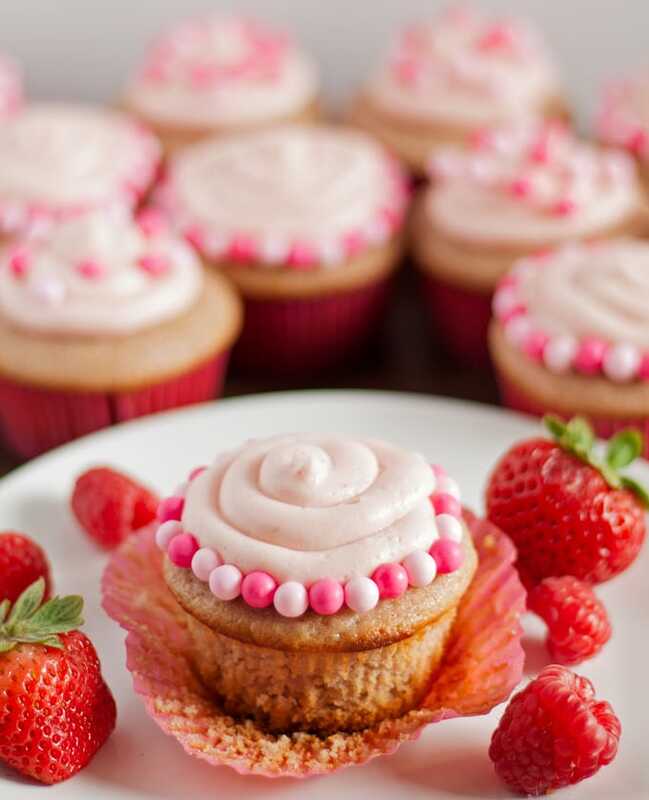 These double berry cupcakes are easy to make, delicious and full of that gorgeous pink color that symbolizes the breast cancer fight. Both the cupcakes and the frosting include a blend of strawberry and raspberry puree and we topped our cupcakes with some pink sprinkles for that extra touch of pink! Double Berry Cupcakes - both the cupcakes and frosting are made with a mixture of raspberry and strawberry puree! Preheat oven to 375 degrees. Prepare a muffin pan with 12 cupcake liners. In a medium bowl, whisk the flour, salt, and baking powder together and set aside. In the bowl of stand mixer fit with a paddle, on medium speed, beat the butter and sugar together until smooth. Add the eggs, one at a time until well mixed. Beat in the milk, strawberry puree, and vanilla extract until combined. Add the reserved flour mixture to the wet ingredients and mix on low for 1-2 minutes, until the wet and dry ingredients are just combined. Pour the batter into the prepared muffin pan, distributing the batter evenly. Bake for 15-17 minutes or until a toothpick comes out clean. Remove pan from the oven and let cool for 10 minutes. Remove the cupcakes from the pan and continue cooling on a cooling rack. To make the frosting, whisk the butter in a bowl until smooth. Then slowly whisk the powdered sugar into the butter until combined and fluffy. Add 1 tablespoon raspberry strawberry puree into the frosting until just combined. Add additional puree if you would like a smoother frosting. Pipe or spread the frosting on the cupcakes when they are completely cool. You can join the Cook for the Cure campaign today too! Make my cupcakes or your favorite cupcake recipe today and post photos of your cupcakes to your Twitter and Instagram feed with the hashtags #10000cupcakes & #donate. 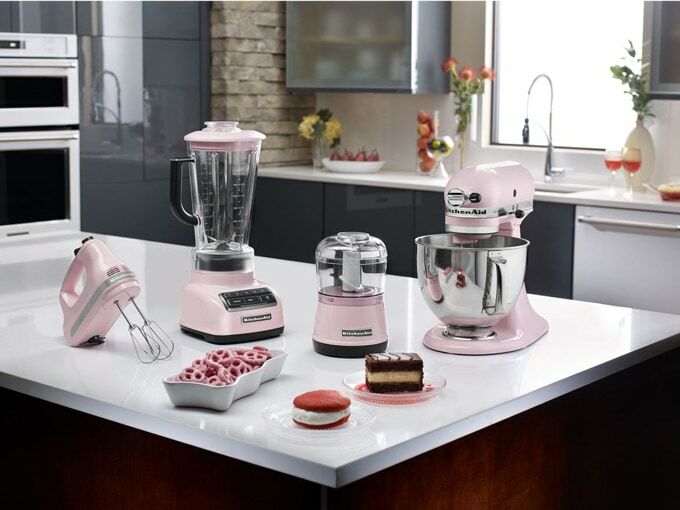 Tag @KitchenAidUSA and KitchenAid will donate $1 to support the Susan G. Komen Foundation! If everyone gets involved, that could end up being a huge donation! If you aren’t able to throw a party or bake cupcakes you can still participate. 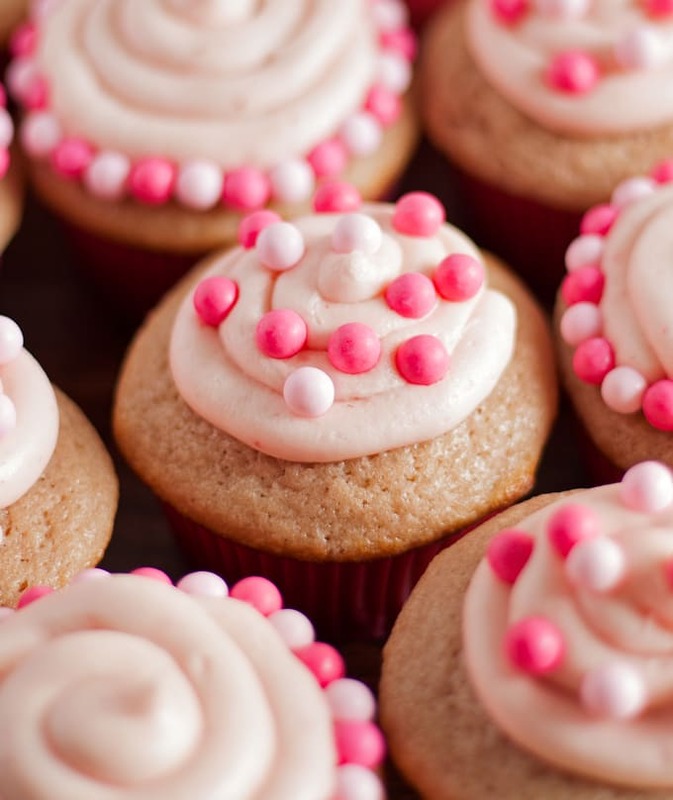 Visit the Susan G Komen donation landing page to contribute even more than cupcakes to the cause! 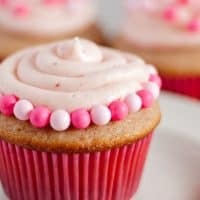 Looking for more cupcake recipes? Try my recipe for carrot cake cupcakes or chocolate coffee cupcakes! Well, how very cute are those cupcake!!! Adorable!! Love those pink appliances too! I think everyone should follow a link and check out the adorable pink stuff! I agree!! I just love those pink KitchenAid mixers! I need a new refrigerator really bad! I would love the Samsung 23 Cu. Ft. Stainless Steel Counter-Depth 4-Door Flex™ French Door Refrigerator (Model: RF23J9011SR)! These look great! I love berry combination, they must taste delicious. I would buy the Maytag Stainless Steel Gas range. I would get Whirlpool 25 Cu. Ft. Stainless Steel French Door Refrigerator. I need the LG 24 Cu. Ft. Door-in-Door Stainless Steel French Door Refrigerator. The Samsung Powerbot robot vacuum….drool. I would like to get the Samsung 23 Cu. Ft. Stainless Steel 4-Door French Door Refrigerator. Thanks for the chance! If I had an unlimited budget, I would definitely buy the KitchenAid 48″ 29.8 Cu. Ft. Stainless Steel Built-In Side-by-Side Refrigerator for $8,499.00! Thank you Sarah! I found them at Michaels. The Samsung stainless steel gas range would be my choice. I prepare most meals from scratch, and also do a lot of baking. A very nice looking and well rated appliance for the money. With an unlimited budget I would get a new washer/dryer set: the Whirlpool diamond steel duet set. The major appliance I would buy, and need…would be the Bosch 24″ Stainless Steel Dishwasher (Model: SHX68T55UC). We would love to get a stainless steel dishwasher. If I had an unlimited budget, I’d buy a Bosch 24″ Stainless Steel Dishwasher. I would choose the Whirlpool 7 Cu. Ft. Electric Dryer. I would buy the Dyson Cinetic Big Ball Animal+Allergy Upright Vacuum! I would buy a new washer and dryer to if I could. I want the LG 4.3 Cu. Ft. Front-Load Washer and the LG 7.3 Cu. Ft. Electric Dryer, my set is really old. I would buy the LG 24 Cu. Ft. Stainless Steel Counter-Depth French Door Refrigerator. I would get the Frigidaire 26 Cu. Ft. Side-by-Side Refrigerator. I would love to get the Cuisinart MultiClad Pro Triple Ply Stainless 12-Piece Cookware Set. I love the Frigidaire 26 Cu. Ft. Stainless Steel Side-by-Side Refrigerator. Thank you!! My husband says they’re delicious! I’d definitely go with KitchenAid 48″ Stainless Steel 6-Burner Steam-Assist Dual Fuel Range, Commercial-Style. Frigidaire 26 Cu. Ft. Stainless Steel Side-by-Side Refrigerator is what I would buy. If I had unlimited budget I would buy one of everything for myself and my mom. Your cupcakes look so pretty & delicious! I’d love a bite even for breakfast this morning! What an important cause to bring notice to with these gorgeous cupcakes! I’m a huge fan of pink and so is my daughter (the pink decorations are so cute! )and we must bake these together!! I hope you enjoy them Lora! I love the beautiful stainless steel dishwasher! These cupcakes are SO fun – I love the colors! I might make them for a baby shower I have coming up! If I could get anything it would be the Samsung 25 Cu. Ft. Stainless Steel French Door Refrigerator! Those cupcakes are almost too pretty to eat – ALMOST! And I”m loving all those pink gadgets – so fun! 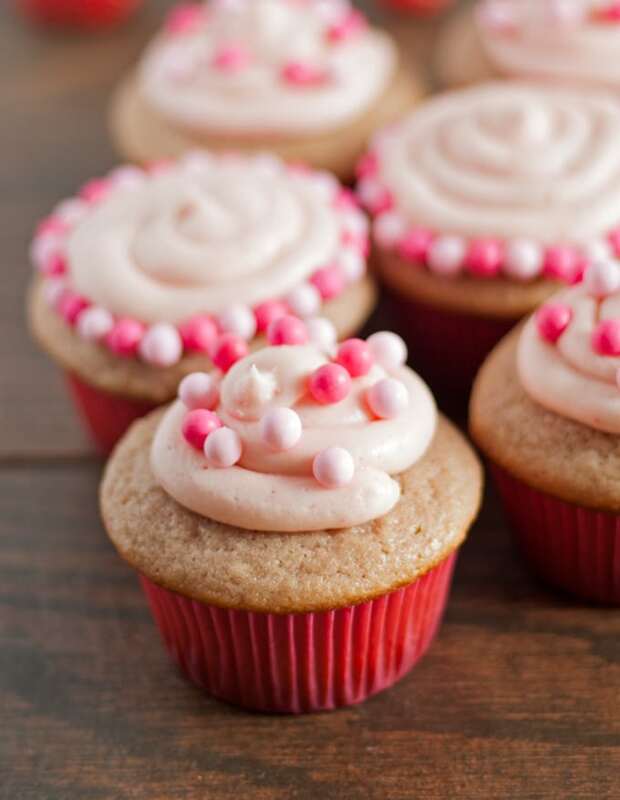 I love the pink Kitchenaid products and I LOVE these cupcakes, they look so amazing! I would buy the GE red stackable washer and dryer. What a great cause and partnership! Nice giveaway, too. And these cupcakes are so pretty! I love the berry frosting. I would buy the Kitchen Aid stainless steel dishwasher. Thanks for sharing this awesome double berry cupcake recipe at Cooking and Crafting with J & J. We love having you and hope to see you again! I’d love any of the cute pink stand mixers. I’m not picky 🙂 Thanks for hosting and giving. What a great cause and what great cupcakes! They are gorgeous! Yum, these look so good! And what a great way to raise awareness! Thanks for sharing at Merry Monday, hope to see you again Sunday night! I want your kitchen. I want all of those appliances. I want these cupcakes. If I joined this challenge I would gain at least 15 pounds. It would be worth it of course. Thanks for sharing these at #SaucySaturdays. Lol I wish I had all of those appliances too. I had to get someone to come out and fix my oven just so I could make the cupcakes lol! I would like the KitchenAid 5-Quart Pink Artisan Stand Mixer. These cupcakes look so good! love the raspberry! It was so fun being a part of this campaign!